Two of my sisters have birthdays this month, so I decided to get back into sewing gear (I haven't done much during summer break), and make them something. This idea for a poncho shirt has been swimming around in my brain for a while. I have a shirt from Charlotte Russe that is similar to these, but is not as long as I would like it to be. I looked at the basic construction of that shirt to come up with my plan for making these. They are easy and fast to make, and oh-so versatile. I could see them with a cardigan over or a long sleeve under in the fall and winter. Enjoy! 1. 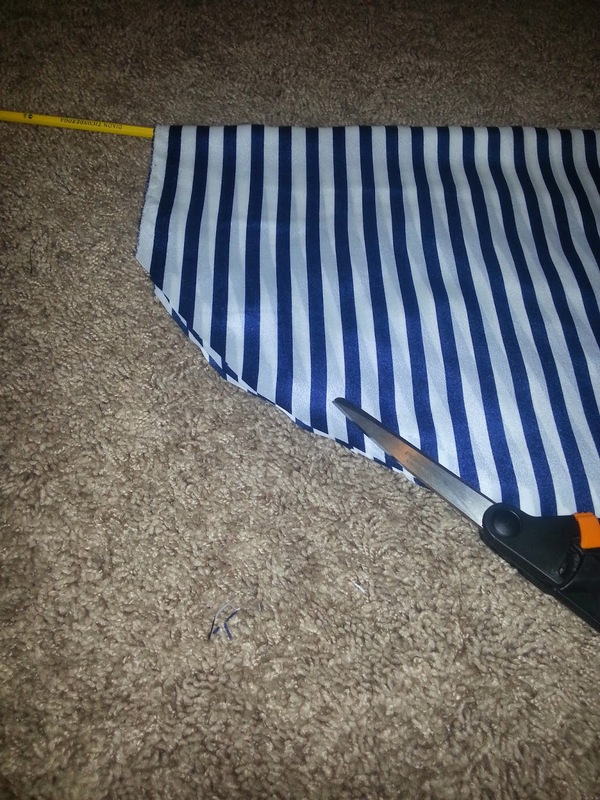 Begin with a 27" x 60" piece of fabric. I used a chiffon. A knit would work well too. I would not use anything too heavy or stiff. You will also need coordinating thread, and elastic thread. 2. 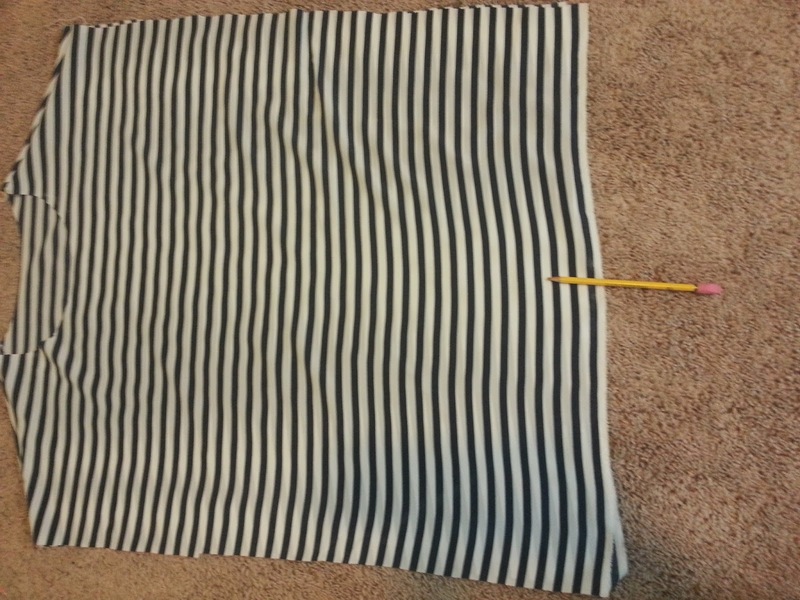 Fold the fabric in half so it is a 27" x 30" rectangle, with the fold at the top. Find the center of that top line and mark it with chalk. Draw out a front neckline as shown--about 8" in diameter (I know it's light--but it is there in white chalk, I promise!). Draw the back neckline (not shown). This will dip only about 1/3 as low as the front line does. Both can be drawn on the top layer of the fabric. 3. 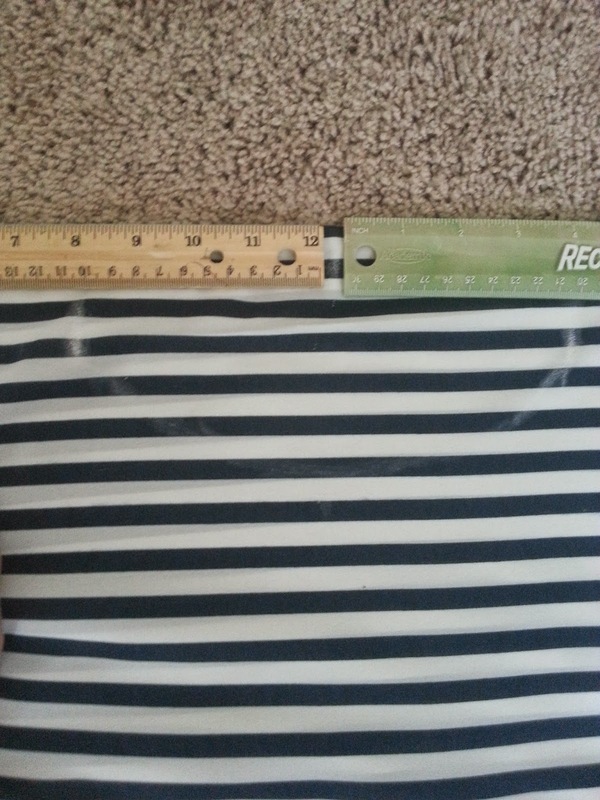 Use two rulers to draw out shoulder lines. 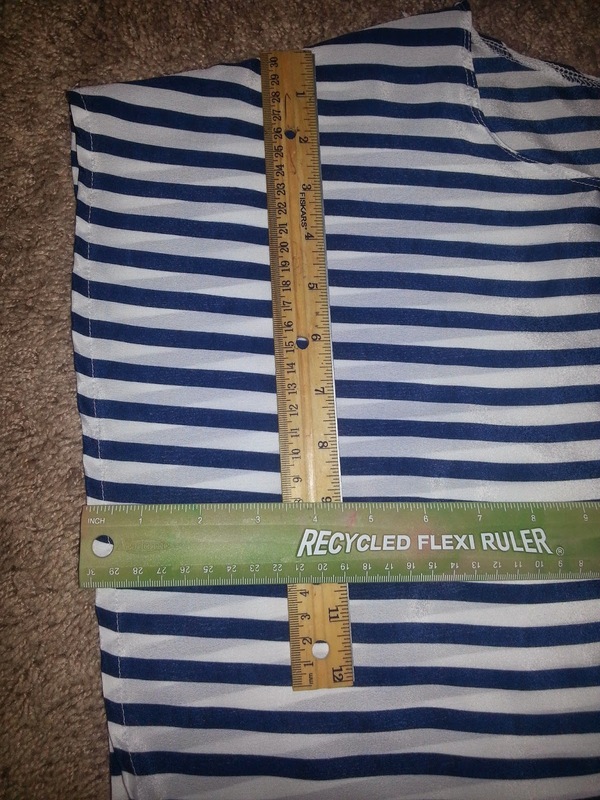 Start at the ends of the neckline, and angle the rulers down as shown (about 2 inches at the widest part of the triangle above the rulers). 4. 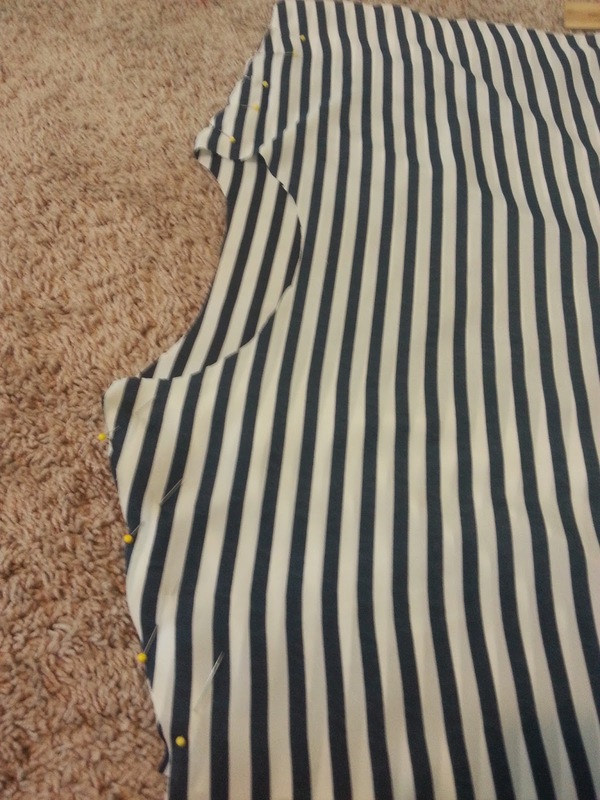 Cut along the the shoulder lines through both layers of fabric. 5. Cut along the back neck line through both layers of fabric (it is the neck line that doesn't dip very low). Here I have already cut the back neck. 6. 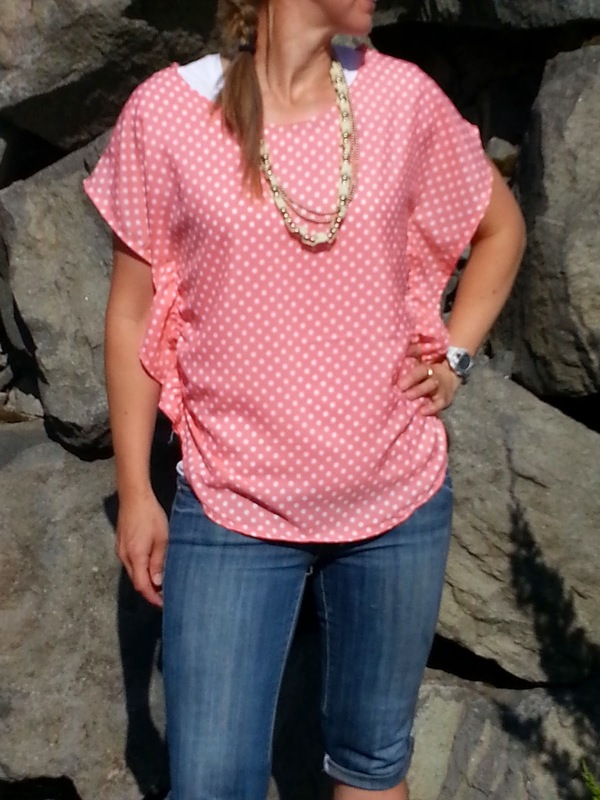 Cut ONLY THE TOP LAYER OF FABRIC across the front neckline. I cut mine halfway, then folded it across as shown and continued cutting, using the folded piece as a guide so it was sure to be symmetrical. This is what it should look like at this point. Not cute yet, but soon it will be! 7. Turn the fabric right sides together and pin the shoulders together. Stitch in place with a 1/4" seam allowance. 8. Once the shoulders are done, turn it right side out again. 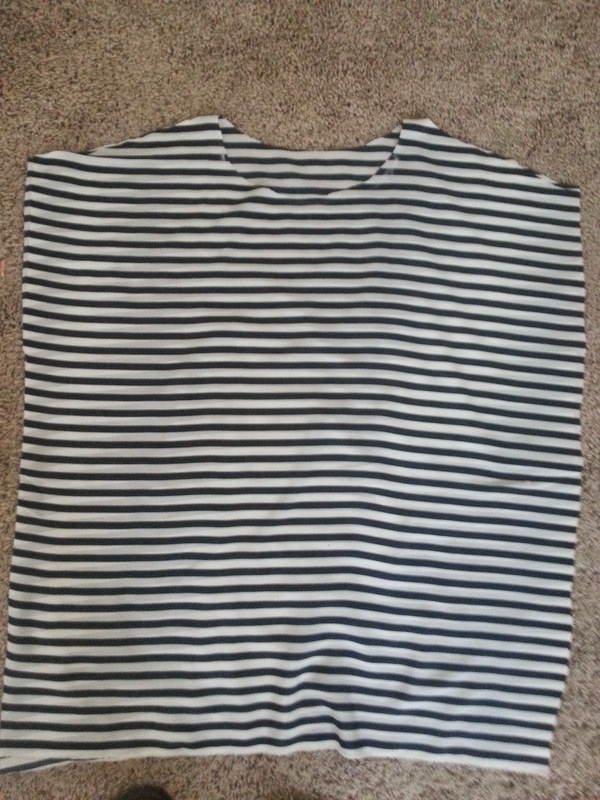 Find the middle of the base of the shirt and mark it. 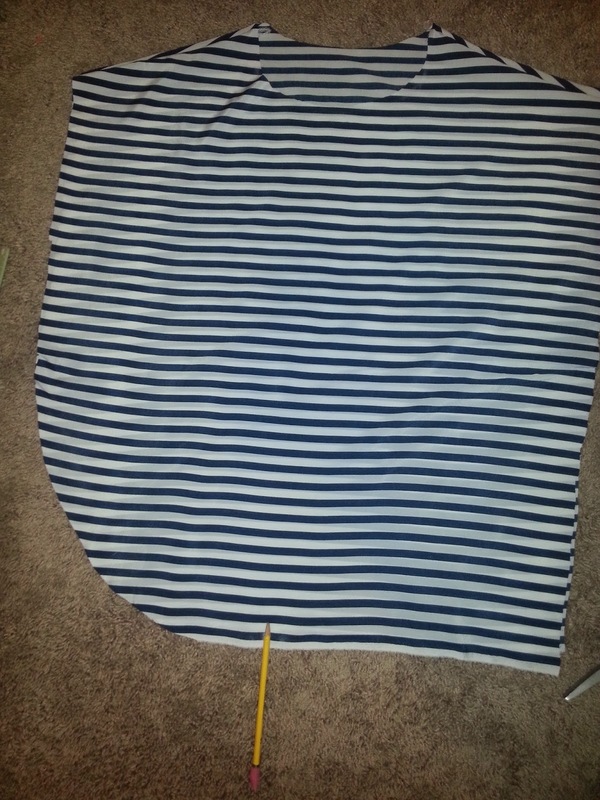 Carefully draw and cut a curved line from the base of the shirt to 1/3 of the way up the side. Here you see one side cut. Notice how I left some flat at the bottom so it doesn't come to a point. 9. 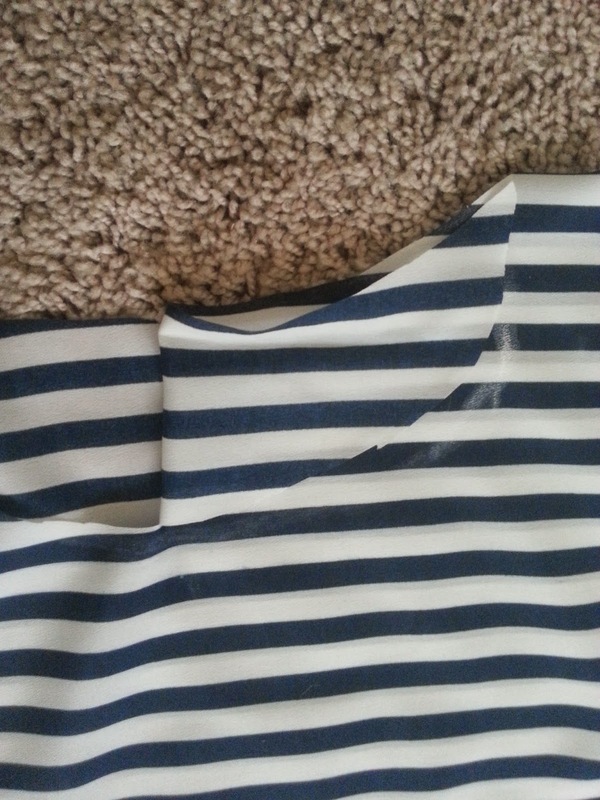 Fold the half that you have cut over to the other side and use it as a guide to cut the other side. 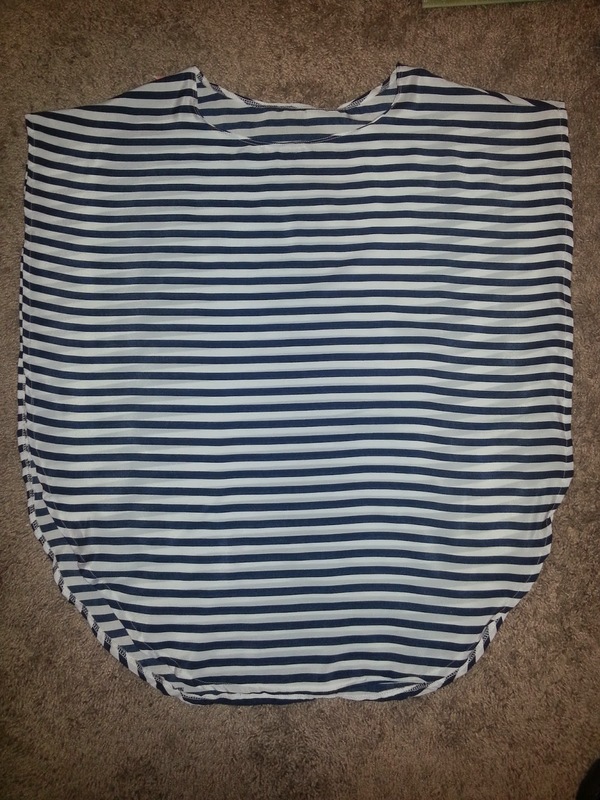 Here is what your shirt looks like completely unfolded at this point. 10. Press and hem all the way around this piece. 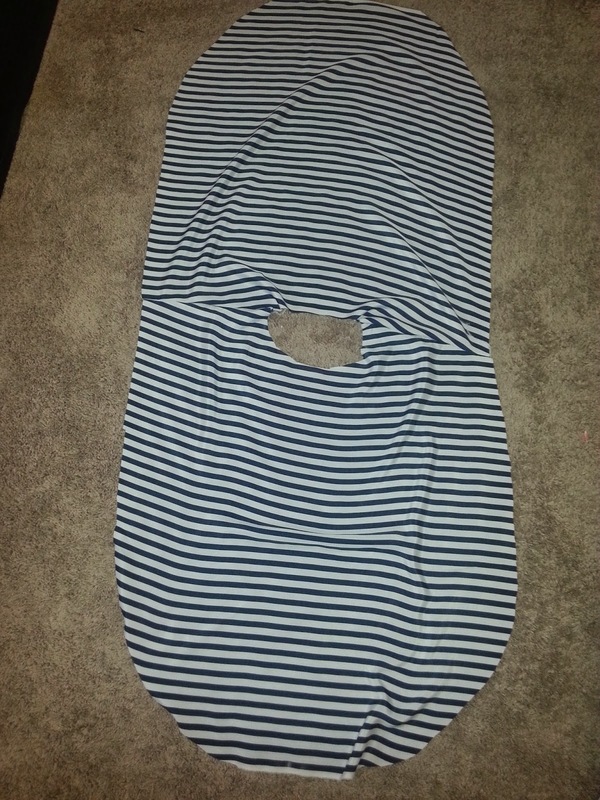 Also press and hem around the neckline. I found that double stitching looked nice around the neckline. It helped it to lay nicely. Here it is all hemmed up. :) Almost done! 11. 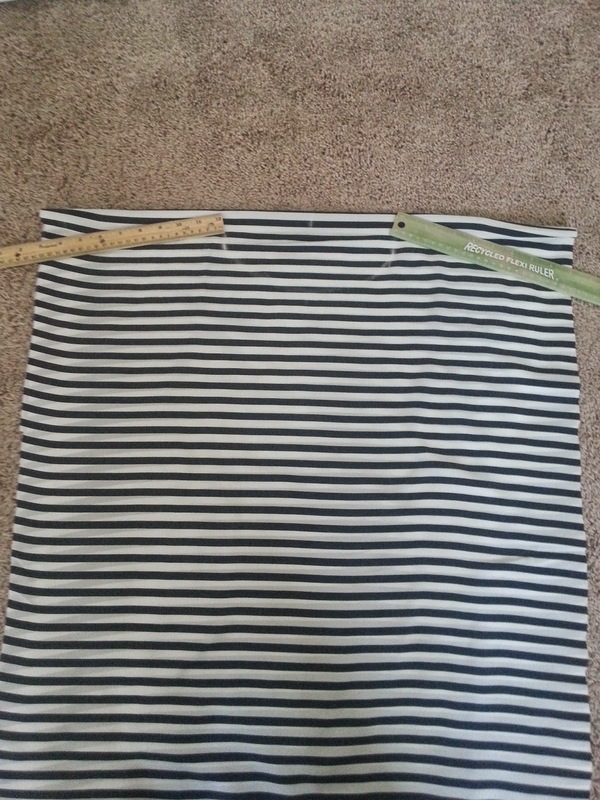 Measure 9" down and 3.5" in from each side of the shirt, and mark it with a pin. 12. 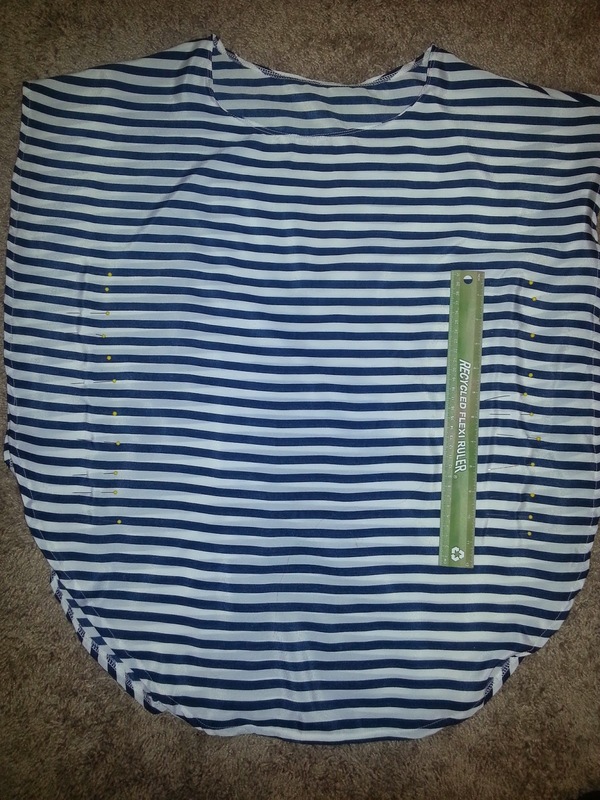 Pin through both layers of the shirt going straight down 12 inches from the the first pin you placed. Your pinned shirt should look like this. 13. Put elastic thread on the bobbin in your sewing machine. If you aren't familiar with elastic thread, it can be purchased in the thread section of the fabric store. You can put it on the bobbin the same way you do regular thread. 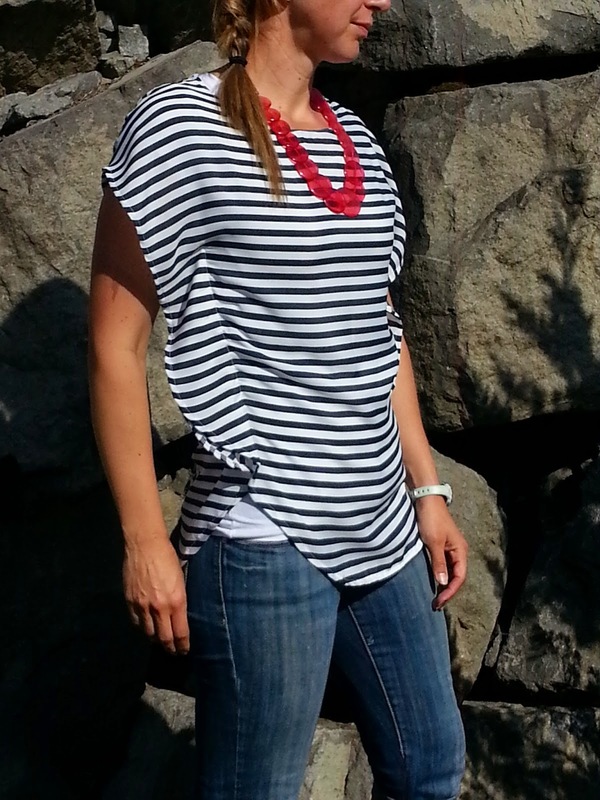 The elastic is what gives this shirt the flowing, wavy sides. Use regular thread on top. 14. Stitch along the pinned lines through both layers, tying off the stitch at the beginning and end with a back-stitch. 15. Iron (using coolest setting for fabric), along the elastic thread. This helps it draw up more to add a little more waviness. And you are done! I made these as gifts, but I think I may need to make one for me, too! 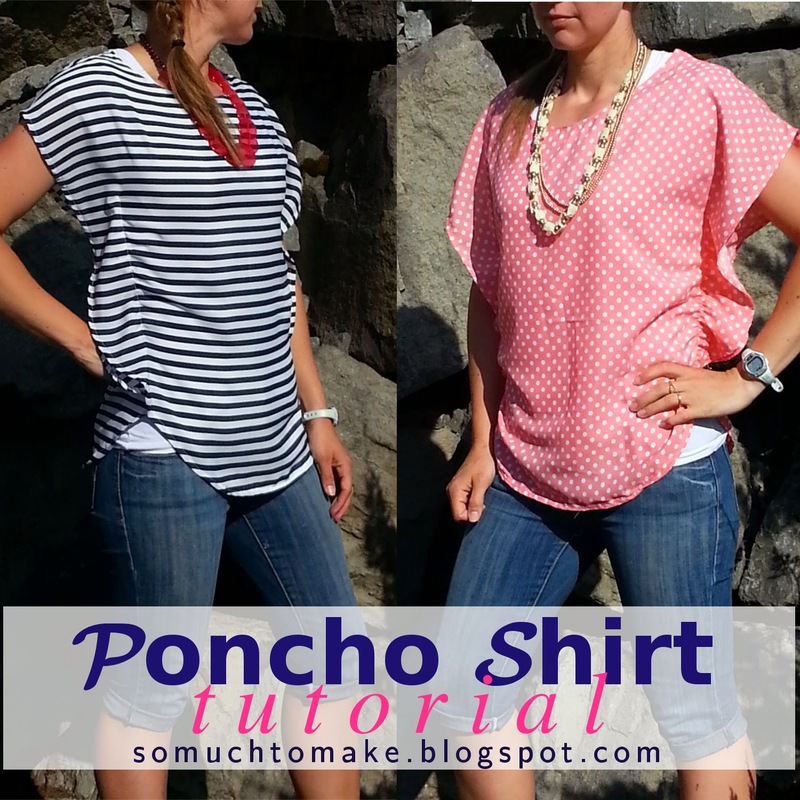 Both poncho-shirt are beautiful! Thanks for sharing tutorial! Thank you, Ana! Hugs from WA, USA! I am not good at needle craft at all, but my mum has just bought a new sewing machine. I think she might now have her first project on her hands!! Thanks, Catherine. I hope your mum makes one--I'd love to see the finished product! Your tutorial is great, I love a photo of every step - photos make way more sense to me than just words. 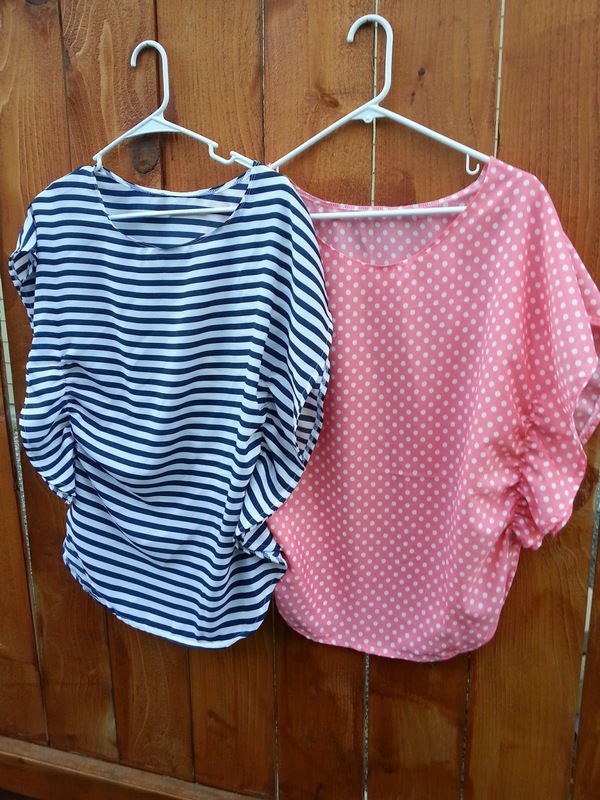 I love these pretty tops. Thank you, Julia. Pictures work better for me, too. I truly appreciate your comment and follows. Thank you! 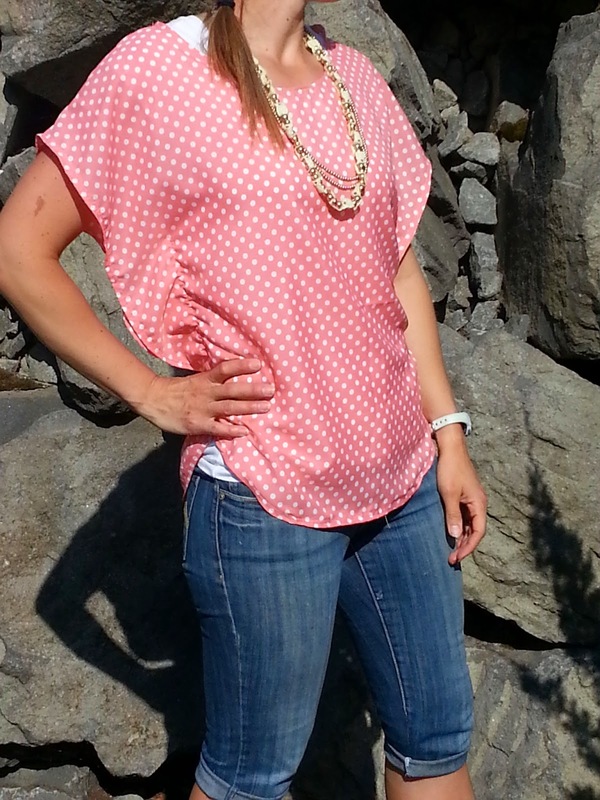 It is a light and airy top. :)I truly appreciate your kind comment. This is so cute! Looks super easy too. I have some knit chevron fabric that I bought a few months ago and have been waiting for the right thing to make with it - maybe this will work. I didn't want anything with sleeve seams as it would make the chevron look weird. Thanks for the tutorial - pinning. Kimberlee, A knit chevron would be great for this! Thanks for stopping by! These are awesome! 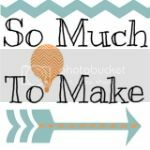 I am pinning so that I can make one for me. Thanks, Amy--for the comment and the pin! I need to make one for me, too! Saying G'day from the Say G'day Saturday Link Party. This is a great idea, my sewing skills are very minimal, I'm much better at knitting and crochet. I'm pinning this to my Crafty Know How Pinterest board just in case I get better. Diane @Mrs U Makes. This really is an easy top--it would be a good piece to learn on! Thanks for the comment and the pin. Just wanted to lyk that you're one of my feature picks for Merry Monday #16. I appreciate you stopping by to link up and I hope to see you at the party again. Thank you so much, Erlene. I am honored. I look forward to linking up every week. Thanks for your great work hosting! 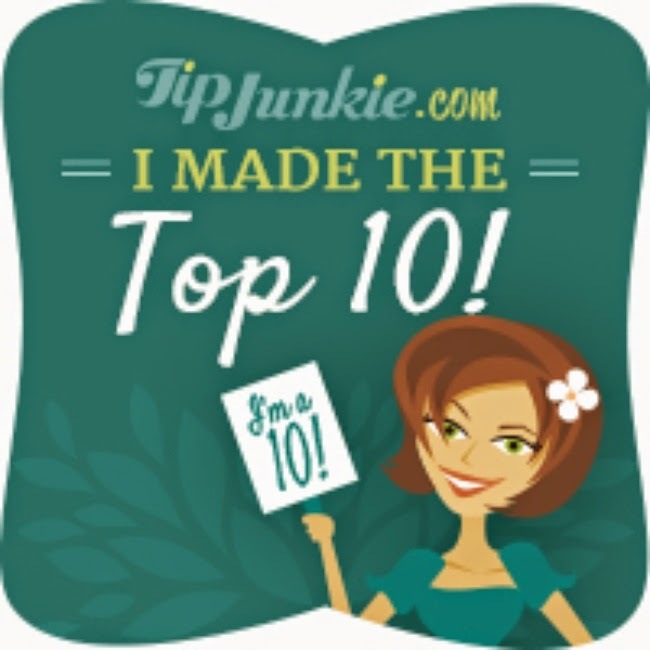 Great share a must try indeed just added to my to do folder!!! Thank you, Mari! I hope you do try it! so cute! I can't wait to try this! thanks for sharing at the Create Link Inspire party. 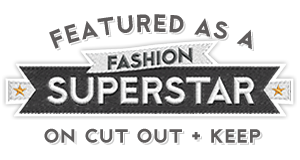 You've been featured today and I've spread the word around ;o)Pinned! Thank you so much! I am excited to be a part of your features! Thank you, Alisha! I'm glad you stopped by. Thanks for the pin and the follow! Thanks bunches, Anne! I look forward to seeing it! What a fabulous tutorial. I know what I'll be making this winter. Thanks so much! That was a super cool article dude. Keep it up. Helix Piercing – Pain, Infection, Jewelry, Healing Time,Detailed Repor.